Four Seasons Wholefoods is Camborne's only independent health and whole food shop. We sell the highest quality natural, organic, local and fair-trade products helping you live a happy, healthy life without costing the earth. Owned by award winning fishmonger John Strike, the company offers you fresh Cornish Fish delivered straight to your kitchen. Our Cornish hampers are ideal to give as gifts for Mother’s day, Birthdays, Easter, Christmas, Weddings, or just to say Thank you to some-one special, they can also be enjoyed as a special treat for yourself. Specialise in home-made pasties and scones produced using original family recipes. Countrywide 'pasty by post' service. A family run fifth generation butcher with its own farm and small abattoir. Also produces speciality meats including ostrich and kangaroo. Pasties made using the finest, freshest natural ingredients avoiding preservatives and artificial additives. Purveyor of fine cheese, meats and sundries. Located in the heart of Newlyn. 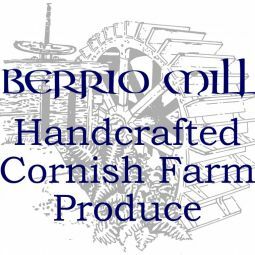 Working in a dedicated kitchen in the basement of an old corn mill, we are the creators of a unique range of Berrio Mill artisan Mustards, Chutneys, Preserves and Jellies. The only produce we don’t make is Berrio Mill Honey, our bees look after that part.